The Shepard Diamond gets its name from Glen P Shepard, who was the purchasing officer of the Natural History Museum of the Smithsonian Institution, Washington DC, in 1958, and who facilitated the acquisition of the diamond for the institute. The diamond is an 18.3-carat fancy intense yellow, cushion-cut stone of dimensions 17.4 x 15.7 x 9.5 mm. The diamond is most probably of South African origin, but nothing is known about the early history of the diamond, such as, the mine of origin, the date of discovery, the original owner of the diamond, the weight of the rough stone, the identity of the diamond's cutters, etc. Even the person from whom the diamond was acquired by the Smithsonian Institution, has not been revealed, but the diamond was acquired not by a cash transaction, but by a barter deal, which involved the exchange of the yellow diamond for a collection of small diamonds belonging to the institution. The smaller diamonds were smuggled goods seized by the United States Customs Service, and donated to the institution . The transaction was facilitated as stated previously by the Smithsonian employee Glen P Shepard. The above list does not include the famous Iranian Yellow diamonds, which consist of 23 fancy light yellow diamonds, which are now part of the Iranian Crown Jewels. 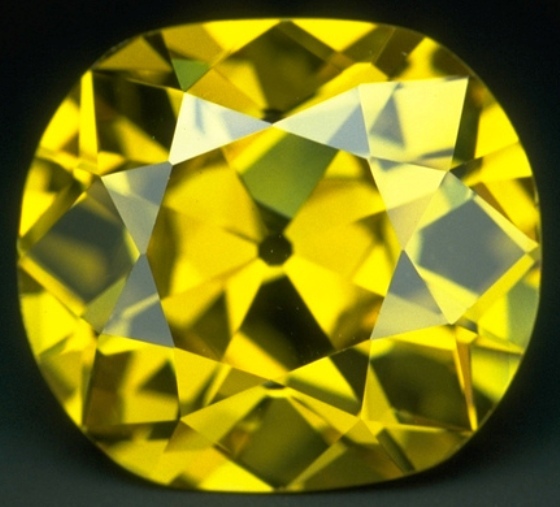 Among the 23 yellow diamonds there are 5 diamonds of more than 100 carats in weight, 17 diamonds of between 50-100 carats in weight, and one diamond less than 50 carats in weight. All the stones are of South African origin, and acquired by Nasser-ed-Din Shah in 1889. A list of these diamonds appear elsewhere on this website. Yellow color in diamonds is generally the rule, rather than the exception. Almost 98 % of the world's naturally occurring diamonds are yellow, having a range in color from the slightly yellowish tinge to the extreme canary and fancy vivid yellows. This is not surprising, because trace quantities of Nitrogen (less than 0.1 %), a common impurity in diamonds, which causes the yellow color, had been incorporated into the crystal structure during it's formation. Nitrogen has an atomic size comparable to that of Carbon, and could replace some of the Carbon atoms in the crystal. The intensity of the yellow color depends on the concentration and the distribution of Nitrogen atoms. Being the commonest in occurrence yellow diamonds are called Type I diamonds. The less common non-yellow diamonds constituting the remaining 2 % are known as Type II diamonds. If the Nitrogen atoms are scattered in the crystal as single atoms, they impart an intense yellow color known as canary yellow to the diamonds. such diamonds are extremely rare (less than o.1 % of all natural diamonds) and known as Type Ib diamonds. Therefore the commonest yellow diamonds which constitute almost 98 % of all natural diamonds are Type Ia diamonds, in which the Nitrogen atoms are found in groups of 2 or more atoms. If Nitrogen atoms occur in groups of even numbers such as 2 or 4, they do not affect the color of the diamonds. However if they occur in groups of odd numbers such as 3 (N3-centers) it imparts a pale to medium yellow color to the diamonds. Normally, groups of 2.3 and 4 atoms are found together in the crystals, imparting faint to medium colors to diamonds. The presence of yellow color as a tinge can reduce the price range of colorless diamonds. On the other hand as the yellow color becomes intense reaching the fancy color ranges the price of the diamond again increases. In May 1997, a 13.83-carat fancy vivid yellow diamond was sold at Sotheby's New York, for a record price of $ 3.3 million. This works out to about $ 239.000 per carat. The previous record for an intense yellow diamond set in London in 1990 was $ 202,000 per carat. Since it's purchase in 1958, the Shepard diamond remains the property of the Smithsonian Institution, and had been on display at the Natural History Museum of the institution at Washington DC.